I know it is spring now – but in terms of the vegetable garden, most of what is in there is still wintery-fare. Choosing rainbow silverbeet – the stalks are wonderful candy colours – bright pink, orange, yellow. & Growing marigolds as companion plants. I know some people think they are tacky – but I love the colour they bring to an otherwise pretty dark winter garden. 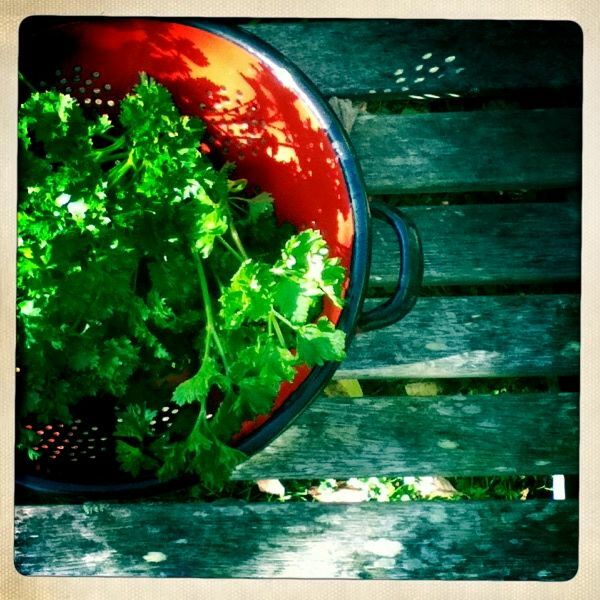 Harvesting greens in my op-shopped bright red colander. 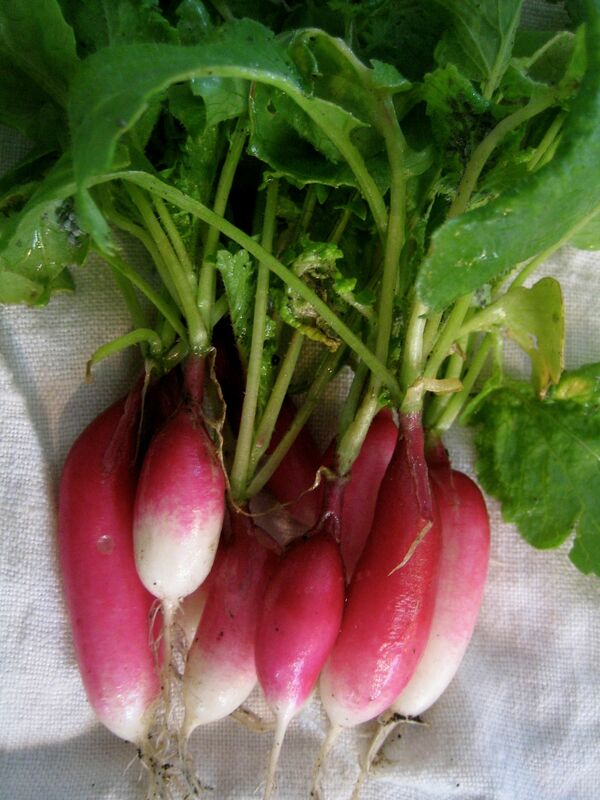 & Growing radishes – their hot pink pop can really liven up yet another green salad. Also, they grow from seed to plate in about three weeks. The closest thing you can get to instant gratification in a vegetable garden. These ones are ‘French Breakfast’ – which I grow because they are much sweeter and milder than other varieties, so more child-friendly. I saw on an Anthony Bourdain Food show that in France people smear these with butter as part of a breakfast meal. I tried it and found it to be kind of gross, to be honest. I think I’ll stick to chopping them up and chucking them in a salad. The French love to put butter on everything, don’t they? My absolute favourite gardening blog is Tend – a blog written by a collective of friends in the USA. The photography, recipes and casual writing style make it a very lovely package. I love that the gardens are ‘real’ looking backyard gardens and not Martha Stewart perfect. 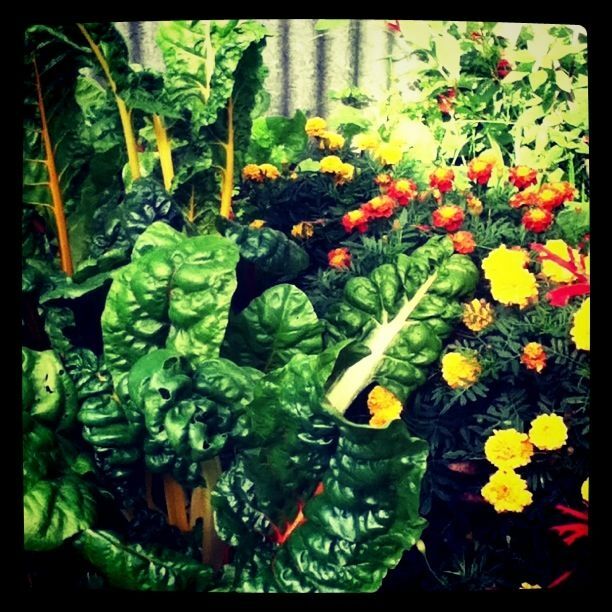 Have you got any other ideas about adding colour to a winter vegetable garden? Very nice, I miss having a vegetable garden! yum yum french breakfast radishes! don’t seem to grow well in pots unfortunately (or I don’t water my pots enough probably). That silverbeet photo could win a prize! Almost makes it look yummy. Ha ha – aah silverbeet – so pretty, yet so iron-tasting. thanks for linking to tend. such pretty colors in your garden. enjoy those breakfast radishes. Hey Martha – thank YOU for tend – I love it! I’m growing my first fall/winter garden this year. I chose carrots (which I found “carnival carrots” in purple, yellow and orange”, beets and butternut squash. I have other “green” vegetables, but those , of course, aren’t colorful. Ornamental kale may be a good choice to add color. I add it to soups and stir fries even though it’s “ornamental”. I have found that it attracts aphids, though. Other types of squash would be colorful, too: pumpkin, acorn squash, etc, if you have the room.